I’ve had several people ask me that question lately. How do you do it all? I’m assuming “all” entails the housework, and the homeschooling, and my hubby being in grad school, and just life in general with 5 little people in tow. I was reading that question in a message sent from a friend. I was reading off my phone while holding a fussy baby and standing in my kitchen. I had to laugh as I looked around…. On most days I can only see parts of my kitchen counter. I do clean it, promise. I just don’t know what happens. Every time I turn around the dishes are piled high again. I do 3 loads of dishes a day. My kitchen floor could double as a sandbox. I can sweep, vacuum, and even mop but one meal later that floor feels like crunchy, gritty, desert wasteland once again. What I wouldn’t give for a dog! My living room is a perpetual sea of legos and train set pieces. There is a lego hotel in one corner, a lego fairy garden in the middle, a tower of blocks in another corner, a house for the trains in the last corner, and a train track encircling it all. There’s also a play tent in my living room currently. For two weeks, one of my shoes was missing. I had to wear my “other” pair-my not so favorite one- when we went outside. I finally found it yesterday though! It makes me feel like I’m losing my mind! But with this mess, no wonder I can’t find things! The kids’ rooms have piles of toys, books, and stuffed animals in every possible space. Most days I can barely wade through the mess. We pick up every night, but I’m not sure it even makes a difference. And can we just talk again about how many things go missing in this house? I lost my shoes, but we daily lose track of car keys, kids’ shoes, markers, scissors, and most importantly, all my pencils! In two days, I’ve already lost 3 pencils. Someone help me! I used to think I was organized! Our homeschool room is always messy. Messy is really too mild a word. Think more disaster area. I have a small space carved out for me to sit on the floor. I have the kids’ work boxes scattered around in a u-shaped pattern so I can reach everything from my little spot. I even have two desks in our house. I end up using the floor as my desk. I guess it’s the only thing big enough. Our bedroom floor is like an ocean of laundry. I sort and fold one load and there’s another one already waiting. I do at least 1 load a day. I’m still trying to figure out why the laundry’s always at high tide. My family is my top priority. The house will always be here. It doesn’t matter if my floor is gritty or my ceiling fans are dusty or if my counters are cluttered. I’ll just try really hard to ignore it (and yes, I’m a perfectionist so it bothers me to no end) and I’ll go play a game with my kids. I put my time and effort into them and into homeschooling. Homeschooling is a full time job. My hubby and I have both agreed that we both work full time. Housework is divided up between us and we do the best that we can, but things are overlooked. Our house looks lived in, and played in, and enjoyed. I keep telling myself that this is a good thing. I hope one day I actually believe myself. 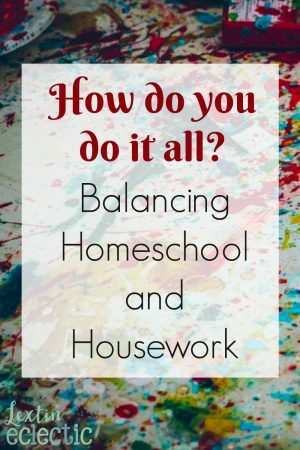 So, if you think I do it all (or that all the other homeschool moms do), you are sorely mistaken. Some of us might be a little more organized than others, but what we really do is prioritize and then let go of the things that aren’t top priority. We can use that giant mound of clean clothes as a perfect spot to curl up and read aloud. We can even make a science experiment from the residue on the kitchen floor. We just try to find the positives in our messy little world. I homeschool my kids. Sometimes, I clean my house. Sometimes it’s midnight and I just give up. Sometimes I fall apart. Sometimes I forget things. Sometimes I am completely convinced that I have lost my mind. Sorry if I made it seem like I’m all put together and perfectly organized. That’s not even close to being true. Homeschooling is about grace. Without that grace, I would not get through a single day. I have to understand that I don’t do this thing on my own-I can’t. I have a Savior who carries me through my days (sometimes I’m probably a very whiny and unwilling participant, by the way). patience, priorities, humility, and surrender. And while I’m learning my lovely lessons in character (aren’t those just the hardest ones? ), you’ll find me in a dirty pair of yoga pants, a stained T-shirt, no make-up, and a pony-tail. I’ll be somewhere in my very messy house if you can find me under piles of laundry and mountains of books. I usually don’t know what day it is or what I’m supposed to be doing the next day, but I do know that I’m having a blast and making some wonderful memories. That might be the only thing I accomplish in a day, but that’s ok. Some days all I feel like I do is change diapers, wipe snotty noses, correct bad attitudes, make meals, and try to pick up. I somehow don’t think that qualifies as “doing it all.” But I like my job. It’s what I’m called to do. So, I might not be doing it all, but I’m giving my all and answering my calling. And that’s how God measures success. How about you homeschool momma? Do you struggle to do it all? This is so great! Thanks for sharing. I have been asked the same thing but with only 3 kids. I can't imagine homeschooling 5 along with my business, etc. You are an inspiration. Thank you for being so honest. I love home schooling too but the house work does suffer-badly! So true!! Just because I homeschool doesn't mean I'm an expert at organization, patience, and cleanliness. Thanks, Lexi! Love this! Lady, I can so relate! Everytime I do the dishes, I turn around and the sink is full again. I guess that's what happens when people live in the house. :/ The laundry is never ending. Thank you for such an honest post! I LOVE this!!! Thanks for sharing so much truth and encouragement, because all of us homeschool moms are dealing with the same thing on some level. So true!!!! We can't do everything all of the time. By the way, I think your house is lovely, even it it's "lived in" state. You're welcome! 🙂 My house is always a mess and it makes me crazy. I'm trying to focus on the more important things though. It's hard to admit that you don't have it all together…. Came across this on Pinterest tonight right when I needed it. I’m also a perfectionist, and it is SO hard for me to let go of the crumby floors and the piles of laundry. But it’s the season I’m in right now and I’m trying to release it and enjoy being with my wonderful children, knowing that Jesus put me in this season to grow my character and my ability to be content in all circumstances. Thank you for being a deeply needed encouragement tonight. You’re welcome! I’m so glad this was helpful to you!